JEE MAIN Application form and Exam Fees 2018 - padhaee "
JEE MAIN Application form and Exam Fees 2018 – The JEE examination application procedure of how to fill the form online with the correct exam fees with aadhar and other id documents.The entire steps to filling the form and scanning and uploading images of photograph is given in the correct format.This application procedure is also applicable for the JEE advanced exam with the respective fees mentioned for boys ,girls,General,OBC and SC/ST categories. Before you start filling the application form,go through these Important points regarding the application form. 1.Candidates of JEE (Main) – 2018 have to apply online only. 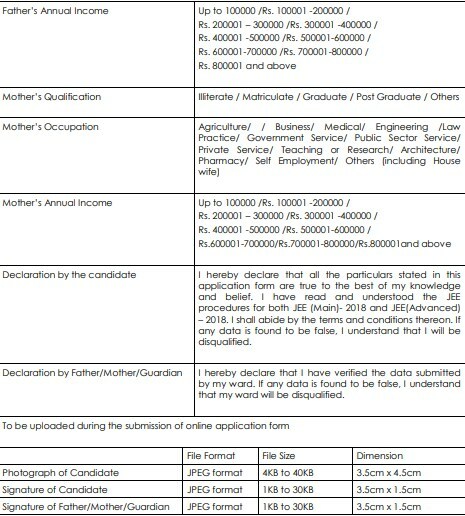 There is no printed application form for JEE (Main). 2.Please ensure that you are filling genuine application form available online at JEE (Main) website (www.jeemain.nic.in). way, be responsible for any wrong/incorrect information furnished by the candidate(s) in their online application form. The letter/e-mails in this regard will not be entertained by JEE (Main) Secretariat/CBSE. 4.Candidates, who are in possession of Aadhaar, shall enter Aadhaar number, name, date of birth & gender in online application for JEE(Main) 2018 for the purpose of his/her identity and authentication thereof. 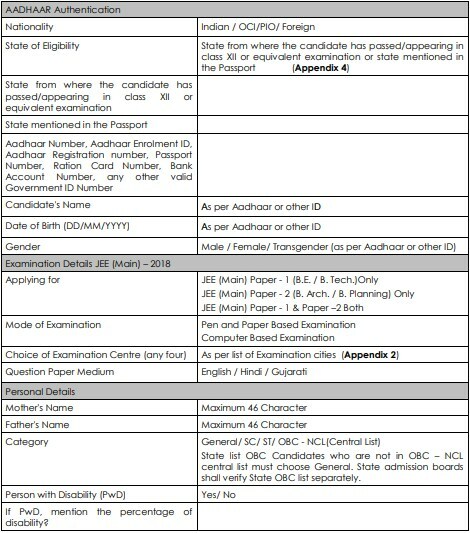 applicant may visit any Aadhaar enrolment centre (list available at www.uidai.gov.in) to get enrolled for Aadhaar. time of filling online application form for JEE(Main) 2018. 7.. Candidates are allowed to submit only one application form. More than one application i.e. Multiple applications from a candidate will be rejected. as registered in Class 12th/ equivalent qualifying Examination. No prefix/title such as Mr/Shri/Fr/Dr/Mrs/Smt/Col etc should be used. 10.The JEE (Main) 2018 application has been made completely online i.e. the candidate have to fill the particulars online and also upload their photograph, signature and signature of father /mother/ guardian. 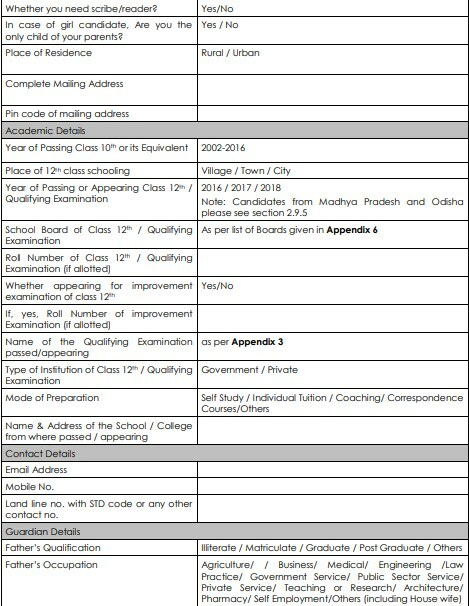 copy of the application i.e. acknowledgement page to JEE (Main) Secretariat/CBSE.However, the candidates are advised to retain hard copy of the application i.e. acknowledgement page for future reference or correspondence, if any. 11.Candidate(s) may check the status of their application on JEE (Main) website. 12.The candidates must have their own personal and valid email id. They are also advised to have their own mobile number. The candidates are advised to retain the same mobile number and email-id in use which they have furnished in the application form because the important information may be given to the candidates through SMS or e-mail. Before filling up the application form the candidate should have a scanned image of his/her photograph, signature and father’s/mother’s/guardian’s signature. These scanned images are to be uploaded during the submission of application form. The photograph should be colour or b/w (but clear contrast) with name of the candidate and date of taking the photograph printed on it as shown below. It should be without cap or goggles. Spectacles are allowed. Polaroid photos are not acceptable. Candidates with unclear photograph are liable to be rejected. Candidates may keep 6-8 identical photographs in reserve for use at the time of entrance examination, Seat Allocation Process and Admission. The fee may be paid either by credit/debit card or through e-challan generated during the online filling of the application form. In case of e-challan, the payment should be made in the Syndicate/ Canara/ ICICI Bank in cash. Please note that fee submitted by any other mode like moneyorder, demand draft, IPO etc. will be rejected.Application fee once paid will not be refunded (full or partial) under any circumstances. 1) If the fee is paid through e-challan by depositing cash in above mentioned bank, the candidate should contact immediately the concerned bank to update his/her fee status on the website.